FreshFarm Markets has 4 farmer’s markets in the Washington, DC area. Although their markets are not located in my neighborhood I am still an loyal customer. The Market close to my community is located on H and 13th Street NE. This is about a 30 minutes bus ride on the X2 bus leaving from Minnesota Avenue Station. This specific FreshFarm’s site SCREAMS farmer market to me. The location is perfect for any means of transportation. It is located 3 blocks from Union Station on the Red Line, there are more than 5 metro buses that come within one block of the market, and parking in the area is free on Saturday mornings. 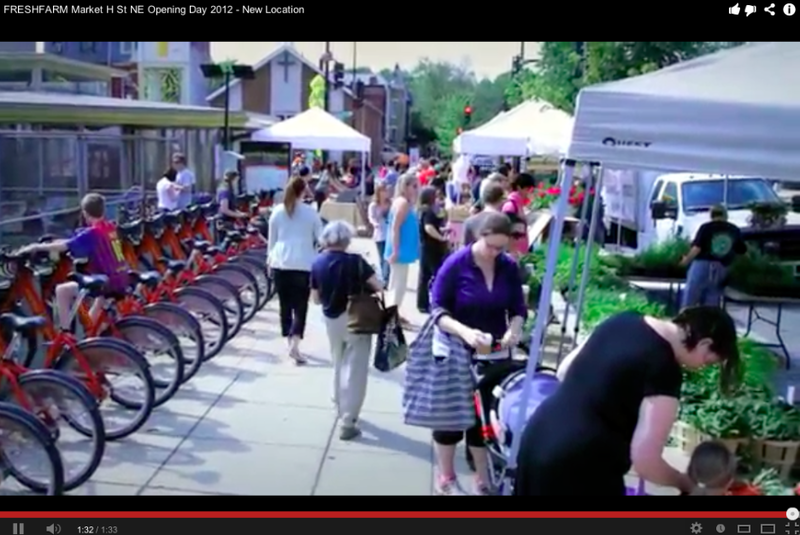 Adding to the transportation perks, Capital Bike Share has a bike parking lot located near the exit of the market. The Capital Bike Share program is a 24hour bike rental service with rates as low as $6.25 a month. The FreshFarm market brings locally grown and fresh fruits, and vegetables into the NE community. Speaking from experience and the statistics on their website, Their Saturday Market is never empty. FreshFarm offers nutrition assistance programs. This is the number one reason I believe FreshFarm supports the community in which it is located. They pay attention to the community as a whole, not just the select few who are financially stable. There SNAP program allows individuals who are receiving EBT (Electronic Benefit Trust a welfare program that allocates funds to families, and individual who are living under the poverty line or just above it) to use the funds at the market. Funds are transformed into tokens of the same monetary value. There MATCHING DOLLAR PROGRAM allows SNAP customers to double, or match up to $15 dollars of their EBT funds. For example, if a customer uses $5 of EBT funds, FreshFarm gives them an additional $5 dollars. The maximum dollars matched each visited is $15, but the tokens never expire, and they can be used at any of the 6 DC or Maryland locations. Such programs erase the barrier that block many people who are unable to buy healthier foods due to financial situations. H Street market is fairly new to the DC area compared to Eastern Market and the Florida Avenue Farmer Market (Union Market). Eastern Market and Union Market both opened in 1871. However, a market wide fire caused Union Market to shut down, and Giving Eastern Market the title of, “DC’s Oldest Continually Operated Fresh Food Public Market”. Eastern Market is open 6 days out of the week, and it is closed on Mondays. Eastern Market is not my favorite place to go because it is a large indoor and outdoor (in the spring & summer) market. I tend to become over whelmed in over crowed, and loud situations. Eastern Market is the Farmer’s market for dedicated customers. If you do not know how to properly blend in, remember prices, and navigate through large crowds stick to smaller markets such as H Street Market.